The IGVC competition is centered around building the next generation of off road, all weather autonomous vehicles. The idea is to create a vehicle and tech stack that can navigate through an obstacle course to given GPS waypoints without human intervention. The map is not known beforehand and while there are certain obstacles that are common anything can be placed onto the course. The competition is scored in three main areas. 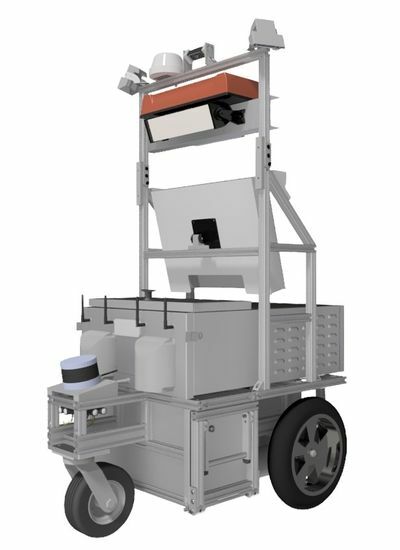 First is the design of the robot as presented in the TDP (a written report on the vehicle) that is given to industry experts for judging. Next the team is scored based on their presentation of their robot. Finally the robot is put to the test by trying to navigate the fastest route on the AutoNav course. If (sometimes no one completes the course) multiple robots complete the course the winner is the fastest time, otherwise the robot that navigates the farthest is the winner. In other words speed is second to safety. There are 44 days 6 hours left before IGVC Competition. We meet in the Student Competition Center (575 14th St). If you are working in the machine shop or mechanical room you will need to wear closed-toe shoes and a t-shirt (no long sleeves). Bring a hair tie if needed. Past IGVC Competitions should be summarized here, like the BattleBots main page. RoboJackets lacked the man power in order to send a team during this year of transition. This page was last edited on 5 October 2018, at 13:56.